The past week...I've been reaching the surface of drowning in mediocre and health homeostasis. For 3 days, I've chosen to be extremely conscious of my food intake and have also been tracking my "usual activity" to see what my baseline norm was. The numbers tell the truth. I coach REALTORS and other Coaches who work with REALTORS and one of the first things I expect is that my clients and their clients TRACK the numbers of thier businesses. Why? Because the numbers tell the truth about where the business really is. They show the gap between the goal and the current state. I've been pretty good about tracking business numbers and am getting better about tracking personal finance numbers (thanks to my husband who so kindly coaches me in his own way on this). I've never really counted calories or been on a diet. I've always been skinny and could generally eat what ever I wanted to. Then age came. I always knew someday this metabolism would change and my habits would have a hard time keeping up. Long story short...that time has come and gone and brought 10 pounds that could easily turn to 20 if I don't kick it to the curb. Left to my own devices over the last year...I've begun working out and allowed homeostasis to creep in time and time again. ARGH....so today I chose to step up a notch to unnatural activities and by searching Wendy's Chilli...found the Livestrong.com page! 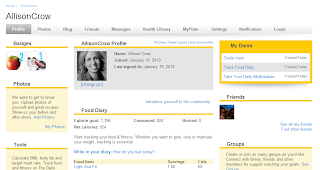 As a coach...I'm thoroughly impressed with Livestrong.coms site and tools! easy steps, small steps and all the info is there. I can't trick it's database of things I could POSSIBLY ingest in to NOT having what Isearch for. (Hows that for bassackward speak) Basically EVERYTHING I could possibly search for in terms of food, drink...heck even my cleanse and detox pills were in that database). And so off I go. Already downloaded the Blackberry App and logged in for fast tracking...and I'm actually excited to watch my progress, to know the numbers of my BODY...and to look hot on the top of the Buckelew Boat this February in Ft. Lauderdale....in my bikini. Did I mention that it also fully integrates with all my social media to make it FUN! The only thing that would make it more fun...is to have a few friends who jump in and improve their health with me! oh and I'm down 3 lbs in 3 days.